Hey guys! Hope you’ve been doing well in this crazy holiday season! I still seriously can’t believe Christmas will be here in a little over a week. It is insane! To help you out, I thought I could give you some pointers on gift ideas. They’re mainly for girls but hey good way to tell your sister, boyfriend or whoever what you want..right? So one of my new obsessions now is Draper James. This line was created by the one and only Reese Witherspoon. It has a southern and preppy style since Reese is from the south. I will probably spend some of my Christmas money on Draper James. Just sayin! Pictured: top left. Well I guess I have a little obsession with socks, my bad. They’re just that cozy especially this time of year. These adorable holiday pattern socks are great for the season and perfect for Christmas Eve or day to lounge around in. 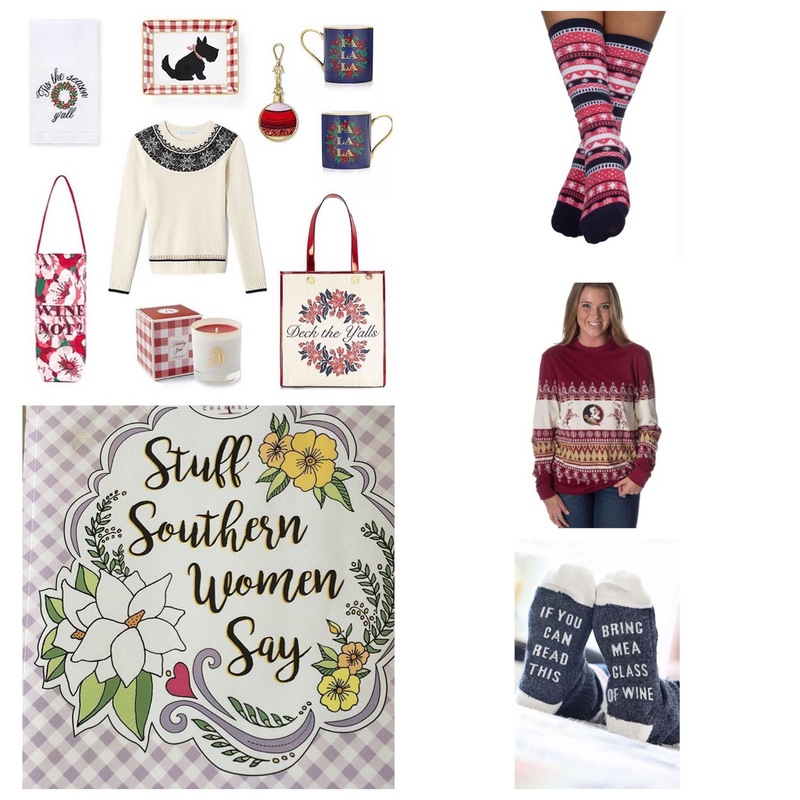 The socks are from Lauren James (pictured top right). Other socks are for you wine lovers out there. If you know me then you know I love me some wine. I mean watching bachelor or a holiday hallmark movie this time of year, it pairs well together ;). These wine-o socks can be found at Belle Lily. Awhile back, a few women in the south made a video series of what southern women say. Now one of the women made an adult coloring book of southern phrases used every day in the south. You really can’t go wrong with coloring as an adult either! Pictured bottom left and you can find it on Amazon. Lastly, pictured in the middle right side, is one of Lauren James college collection shirts. Of course I chose the fsu one. I had to pick my alma mater. Her clothing is always comfy and I wear one of my long sleeves from LJ way too often. But nothing is wrong with that..well at least for me it isn’t! Well there ya have it for my gift guide. Hopefully you all have gotten most of your shopping out of the way but if not, then I hope this helps. Have a great day and week!